Earlier this week I finally got to get up backpacking in the south Cascade’s Goat Rocks Wilderness, and it was incredible! I had hoped to make this trip last year towards the end of July with my friend Danni, but the snow level in the Goat Rocks was still too low (we went to Mt. St. Helens instead, and that trip was also awesome.) 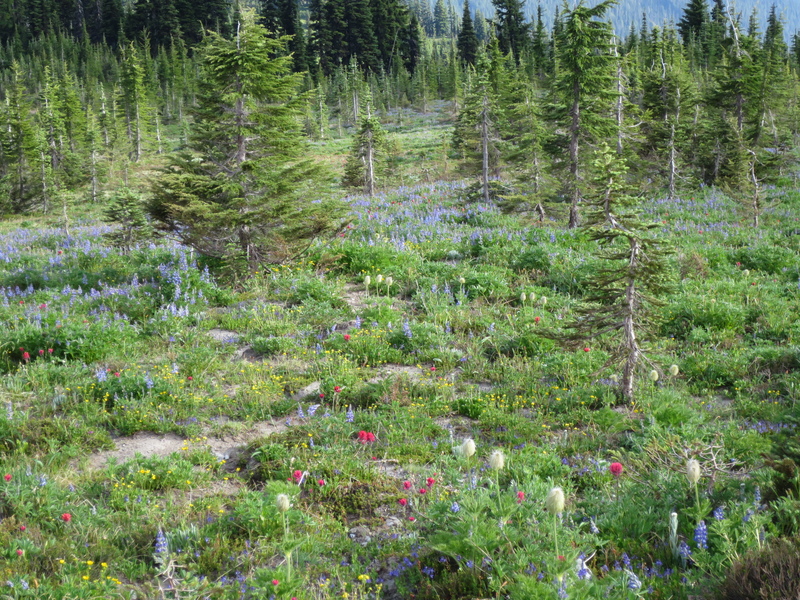 This year, the snow is gone more than a month earlier than usual, so we were able to go in June, and hit the the peak of wildflower season! (I know I say this every time, but…) the Goat Rocks Wilderness may be my new favorite area in Washington. This area has everything: incredible views of Mt. Adams, Mt. Rainier, and Mt. St. Helens, frozen alpine lakes, alpine meadows full of wildflowers, and panoramic jaw-dropping views complete with waterfalls and wildflowers. My friends Owen, Gabriela, and I made a 3-day trip June 21-23, 2015 with a clock-wise loop on the Goat Ridge/Goat Lake trail, stopping for night one at the junction of the Goat RidgeLily Basin trail and the Snowgrass Flat trail, then an ascent of Old Snowy Mountain on day two, and then down via the Snowgrass Flat trail on day 3, for a total of ~21 miles and ~5000 feet of elevation. We started at the Berry Patch trailhead, though the loop can also be started at the Snowgrass trailhead. Patches of snow start around 6,500 feet. The entire Goat Lake loop and Snowgrass trail are snow-free (though Goat Lake is still mostly frozen.) Snowgrass Flat is snow-free except for small patches here and there, and barely any snow on the trail. There are still snowfields to cross on the way up Old Snowy Mountain, but none are on steep slopes and we were able to cross them without difficulty with no special gear, and it was easy to see the way. It was very windy on Old Snowy, though. Elk Pass appeared passable, though we didn’t go that way. The trails were all in excellent condition with only a few minor blowdowns to go over or around, and easy snow to cross on the higher elevations. Minimal mud and no difficult water crossings. The road, though 20 miles of occasionally-potholed gravel, was in pretty good condition and most cars should have no trouble. I really loved the Goat Ridge/Lily Basin trail and Goat Lake. The panoramic views, frozen alpine lake, plunging waterfall, and views of the ridges of Goat Rocks are spectacular, with Mt. Adams dominating most of the time. Old Snowy Mountain was super fun, with ambles through the gorgeous wildflower meadows of Snowgrass Flat along the way, then a windy, rocky, climb on top of the world, with views of Adams, Rainier, St. Helens, and 360 degree views of the Goat Rock Wilderness and South Cascades. The wildflowers are full-on right now. Lupine, Indian Paintbrush, Dr. Sueuss-ian puffballs, and many more flowers I can’t name are all popping in every color of the rainbow. Snowgrass Flat is a meadow-lover’s dream. 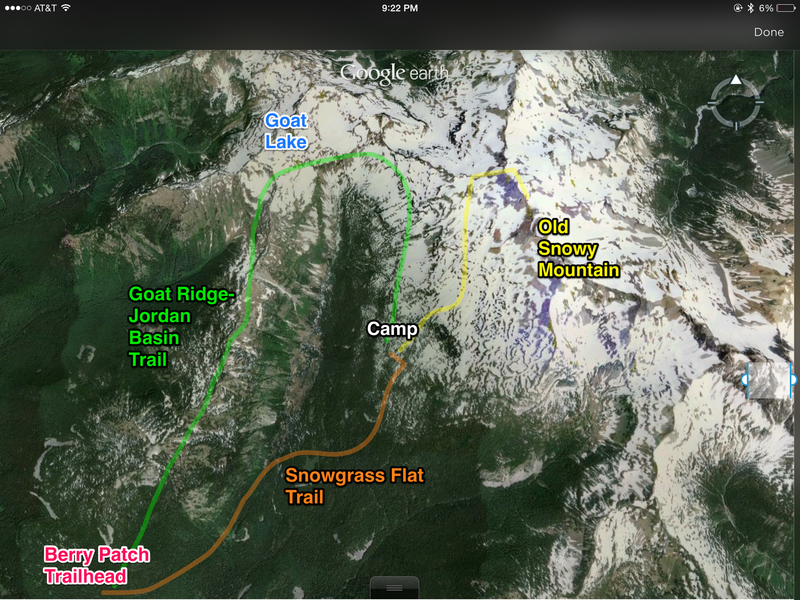 The least interesting part of the hike is the Snowgrass trail from Snowgrass Flat down to the trailhead. That section is a nice walk through big trees, but minimal views. If you have the time, do the 12-mile Goat Lake loop instead of the 8-mile in-and-out to Snowgrass Flat. It’s worth every step. 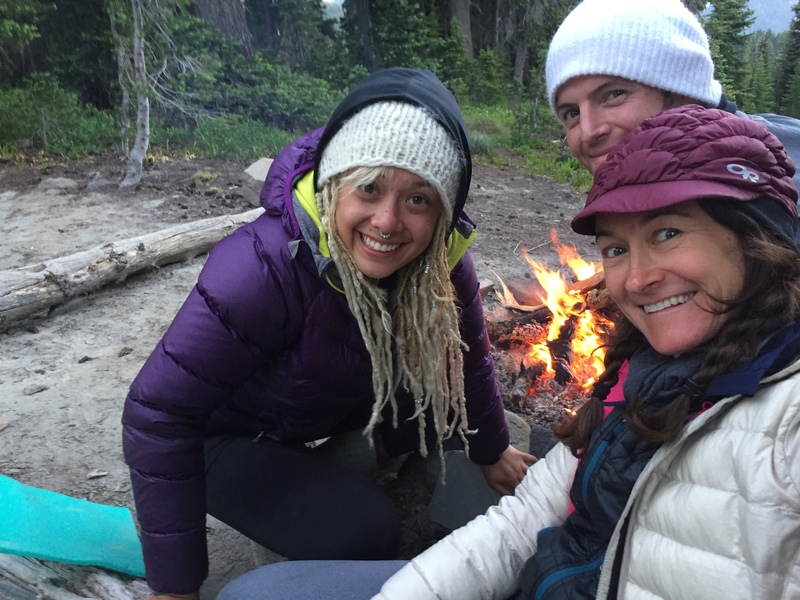 There are abundant beautiful campsites in this area, and camping near Snowgrass Flat is the perfect base for exploring the area. Since we hiked sunday-tuesday, we saw very few other hikers and none were camped near us. 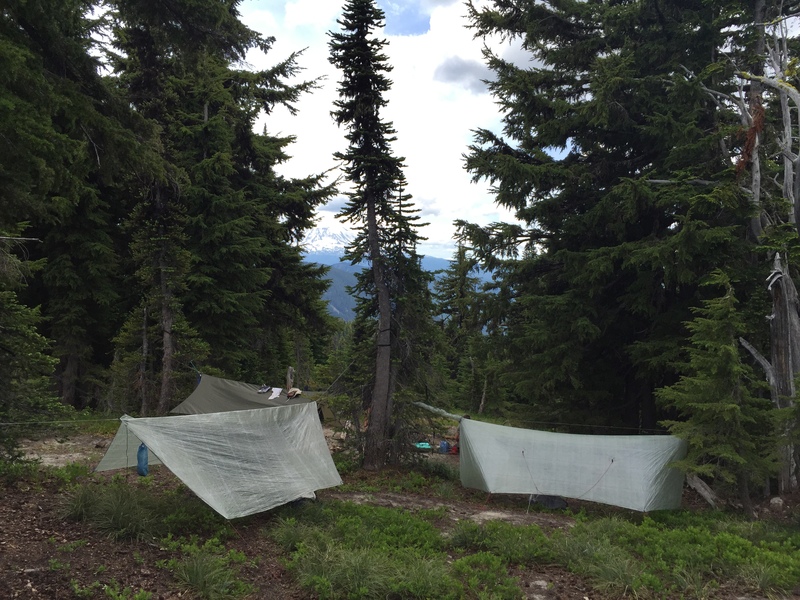 We camped in hammocks and there were ample sites in the area around the lower parts of Snowgrass Flat that could accommodate hammocks. The views get better as you go higher, though, so tents might have afforded us more options, but we love sleeping suspended in the trees. We saw a few goats, marmots, birds, chipmunks, and tadpoles, and heard coyotes yipping and howling. Our weather was perfect, mostly in the 60’s in the day (tuesday got up into the low 70’s) and down to the high 30’s at night. Mostly sunny with some clouds, and no rain. It was fairly windy at times, though, particularly on Old Snowy. Bugs were annoying but tolerable (with DEET), though they got worse when the wind died down. Whoooooa, so pretty! That’s great that you did a trip report for WTA, I need to be better about that. Previous Previous post: First Jar of Sweet Jaime Honey!